Melt the butter in a saucepan over medium heat, add the onion, garlic and cook for about 5 minutes, stirring occasionally until just softened. Add the carrot, cauliflower to the pan and pour over the cider. Season it with salt, pepper and a generous grating of nutmeg. Bring to a boil, then reduce the heat to low, cover and cook gently for about 50 minutes or until the vegetables are very soft. Return the soup to the saucepan and stir in, milk and cream, taste and adjust the seasoning, if necessary. Simmer soup over low heat, stirring occasionally until heated through. 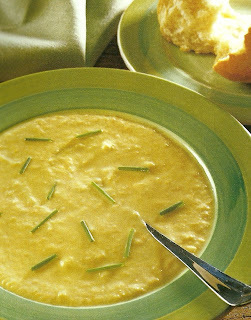 Ladle soup into warm bowls, garnish with chives and serve. If you don’t have hard cider, substitute ½ cup each; white wine, apple juice and water. I hope you enjoy this Cauliflower and Cider Soup Recipe.